An Appeal to Republicans: Changing the Motto Is a Cost Savings » « SecularVoices is on FtB! Obviously. I see where they’re going with this, but it may be an overreaction to the complaint. They’re trying to avoid being sued by someone who wants to display a more controversial message, and could use the allowance of “Jesus” messages as a precedent. I don’t think that would be a good precedent to allow hate speech, but it could certainly be used to force the ad company to allow Church of Satan or atheism ads, which would be a total affront to American society (/sarcasm). Of course, Pastor Perdue displayed his lack of understanding of the First Amendment by categorizing this new policy as a violation of free speech. Those words do not mean what he thinks they mean. What he, and arguably way too many people, thinks free speech means is that he is free to buy an ad from a private entity and have it say what he wants. That’s just not true. Free speech in the Bill of Rights simply refers to the right to say what you want in public without fear of prosecution or other punishment by the State. It doesn’t mean you can say anything you want without fear of consequence from a private party, and it doesn’t say you can buy an ad from a private party without limitation of its content. Personally, I hope he sues, just so he can waste some of that tax-free church money and recirculate it into the economy. My gut tells me that no lawyer with an understanding of the First Amendment would take such a case. Then again, it’s an opportunity to grandstand in public, so who knows. UPDATE: The decision to discontinue the ads was made by the city transit office, not a private company. However, this doesn’t change much in regard to the premise of the pastor’s complaint. It becomes an Establishment Clause dispute, which is what the city will be using as its defense of the decision. Since the ad was a reference to a specific faith, the city can deny the ad by saying approval would constitute favoring one religion over another. To avoid complaints and maintain neutrality, they could deny religious ads altogether. Can you say Larry Klayman? While Klayman is technically a lawyer, he probably does not meet the second part of the requirement that you postulated: understanding the First Amendment. Or for that matter, Orly Taitz? it’s not a private entity, it’s the city transit authority. So it is a free speech issue and a pretty frequently litigated one, with the results usually being pretty fact specific. It’s still not a free speech issue, despite the claim made by the pastor. If the decision was made by the city and not the advertising firm that handles the ad space, then it’s an Establishment Clause issue at best. It appears the complaint of the pastor has evolved as well, now that he’s obtained counsel (by his word). He’s not being denied speech. He’s being denied specific references to his faith. 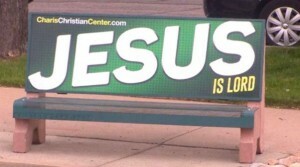 http://gazette.com/pastor-told-he-cannot-advertise-jesus-on-colorado-springs-bus-benches/article/1578962. the decision was made by the transit authority. It’s a first amendment issue involving forum analysis. When a government agency opens up government property for non-government speech, it creates a forum. Depending on a number of factors, the government cannot bar speech based on its content or viewpoint. For example, a Pennsylvania government agency couldn’t bar a PSA advising felons they had the right to vote even though it had a policy banning “non-commercial” ads. PITTSBURGH LEAGUE OF YOUNG VOTERS EDUCATION FUND v. PORT AUTHORITY OF ALLEGHENY COUNTY. On the other hand, a Michigan entity could bar anti-Islam ads AFDI v. SMART. Can a private party, like a bakery,limit content on a wedding cake? They can refuse to make/sell it, yes, depending on the reason. If it’s because the content is hateful/offensive, yes. If it’s because the persons purchasing the cake are of a certain group protected by civil rights laws, then no. Free speech has nothing to do with cakes. No one is being prosecuted for saying something on a cake. If they were, that would be a free speech issue. Whether or not something is offensive is largely a matter of opinion. “Offensive” seems to mean if it offends a member of a certain group. I know of no logically consistent definition of “offensive” which privileges the opinions or feelings of one group over another. Yes, it’s the opinion of the baker/owner of the business. Any gray areas would be fought over in the courts. If you’re looking for a black and white answer to your questions, you won’t get one. Regardless, none of these examples really have anything to do with free speech.